During my time in Sweden I decided to help out IYPT Team Sweden with building scientific apparatus to help with solving the problems set for the tournament in July 2014. First a little background on IYPT: The International Young Physicist Tournament is a competition aimed at senior secondary school (aged 15 to 18) students. A set of physics problems is issued approximately 12 months before the tournament, students then have to conduct experiments and form some kind of understanding of the problem. The competition a debate in the form of a presentation, opposition, and review by three individual teams. My next few blog posts will go into a little detail of some of the rigs that Felicia and I helped design and build for Sweden. 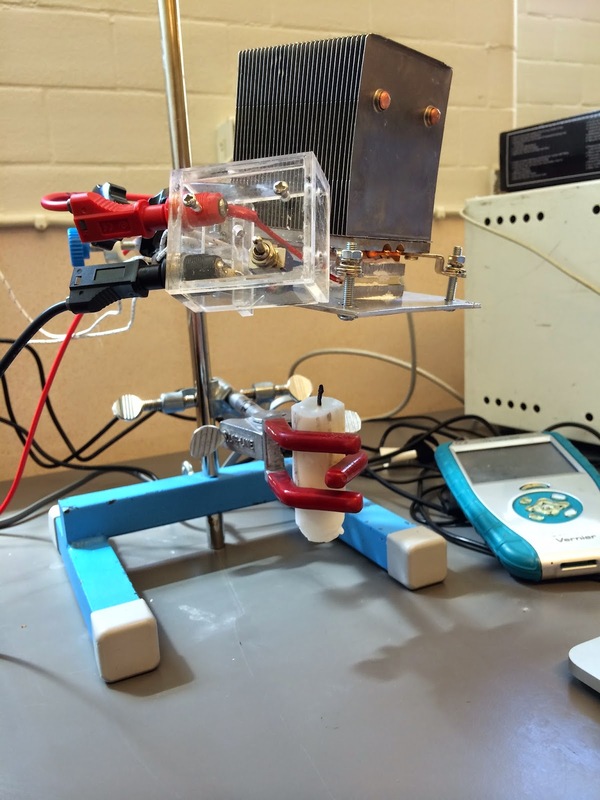 The rigs have been designed and built to gather accurate experimental data from the results of experiments. 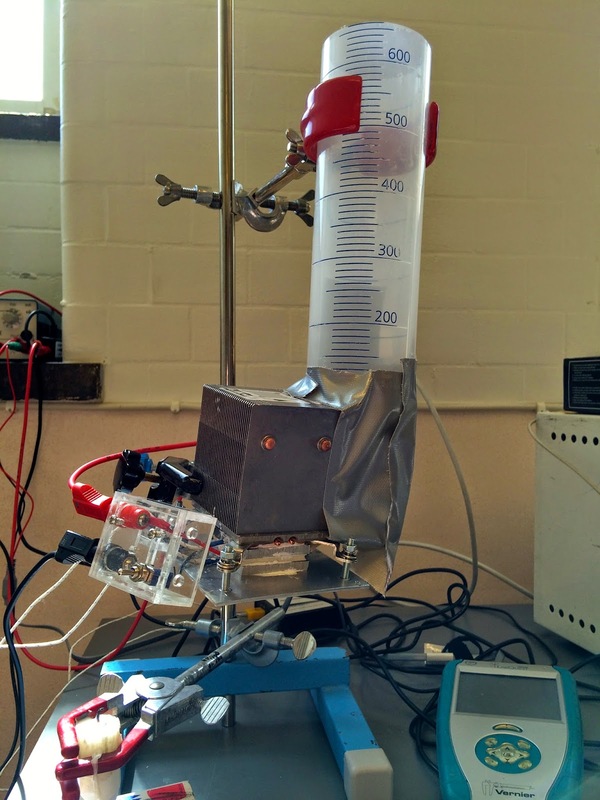 The title of this problem was "candle power plant" and specified that a device was to be constructed that converted the thermal energy released by the flame of a candle into electricity. First lashup with the peltier generator. 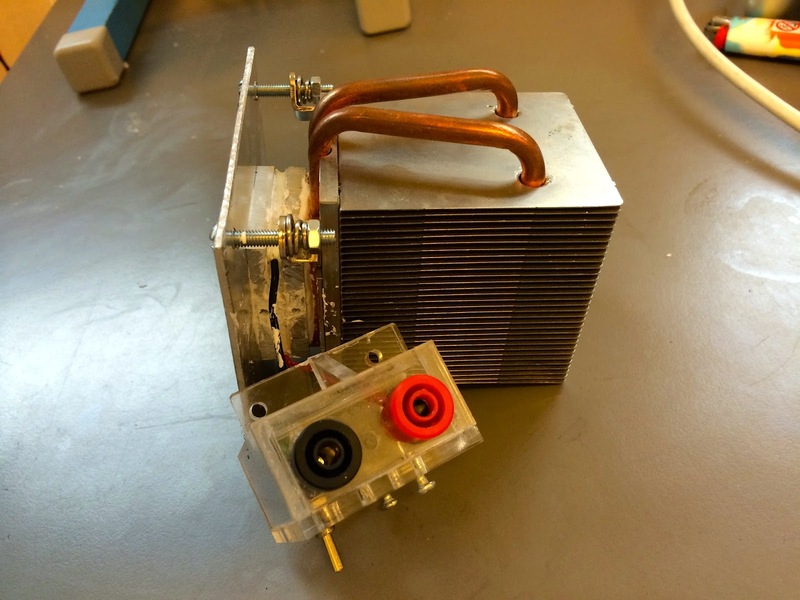 The Peltier element was removed from its home and sandwiched between an aluminium plate to act as a heat spreader and a computer CPU heat sink for cooling the cold side. I drilled a 1.5mm hole into both heat spreaders, this was to allow a thermocouple to be connected to each of them. the hot and cold side heat spreaders. 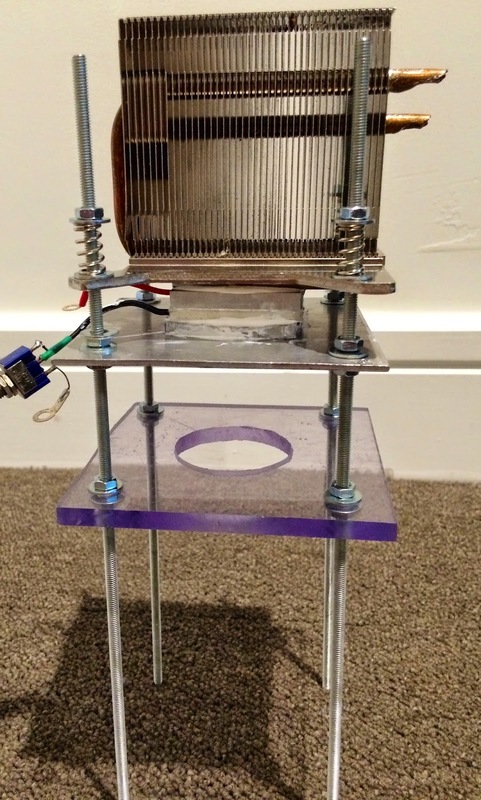 This setup worked a lot better and allowed some useful data to be collected, the heatsink however was not big enough to dissipate all of the heat from the candle. To try to counter this, the students added a simple convective chimney made from a piece of a dead measuring cylinder. This improved the power output by approximately 20% and allowed the power plant to run longer before overheating. 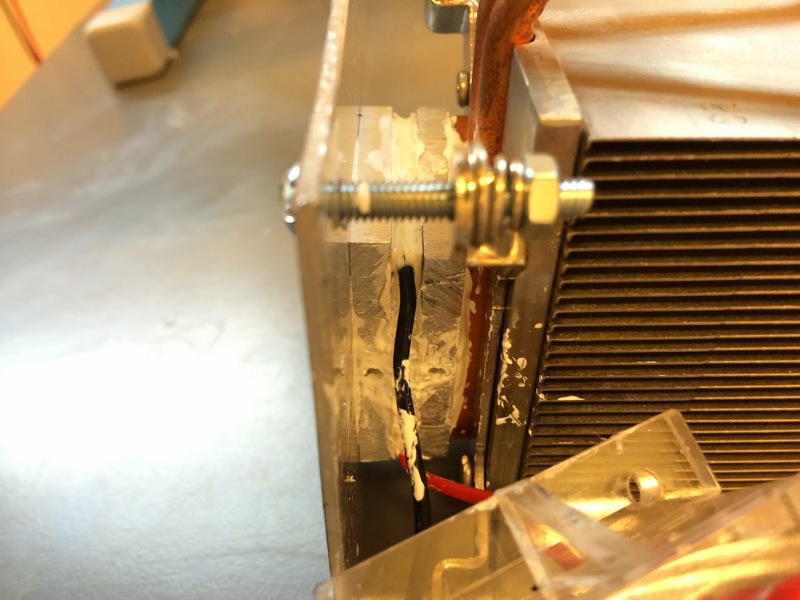 We made sure to keep the hot side at less than 110˚C to avoid damaging the peltier. Chimney gaffer taped to the heatsink. 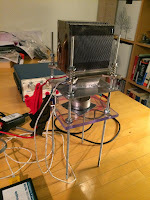 After those tests we set about making a more robust power plant that didn't need a retort stand to hold it together. We came up with what you see below, each of the parts is mounted to threaded threaded rods using nuts. 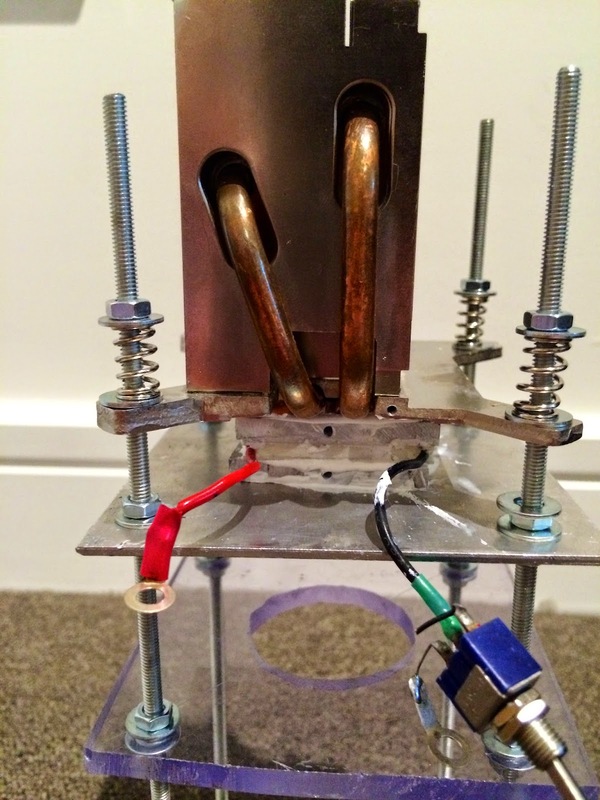 The heatsink clamps the peltier between the two heat spreaders with the springs allowing for thermal expansion without crushing the peltier. To provide an electrical load for the peltier we used a decade resistance box of appropriate power rating. As with most of the other systems we have built, Vernier lab hardware was used for data collection. 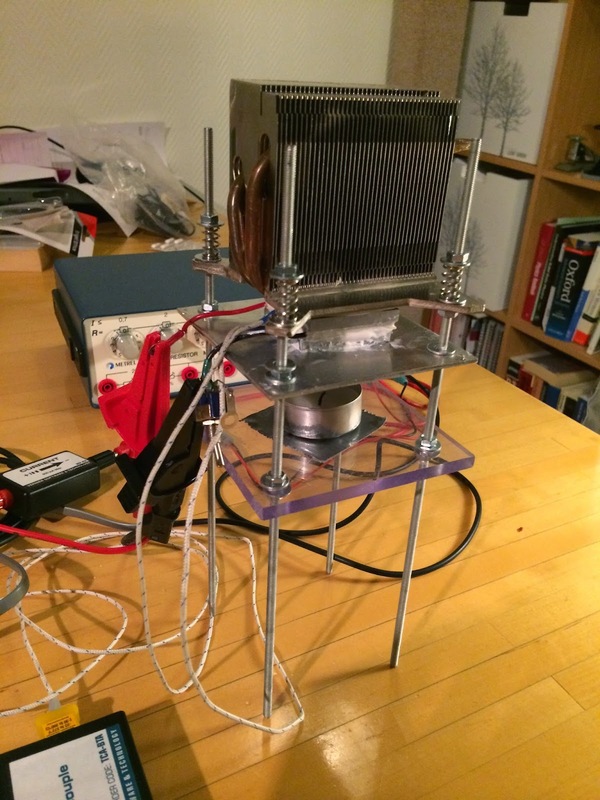 A current probe between the peltier and the resistance box. We used an original Labquest for data collection as this was the only interface we had with four analogue inputs. At peak output the power plant would produce about 2W before things began to overheat. Assuming the candle is around 100w this puts the peak efficiency at around 2%! No powering the national grid with candles by the looks.